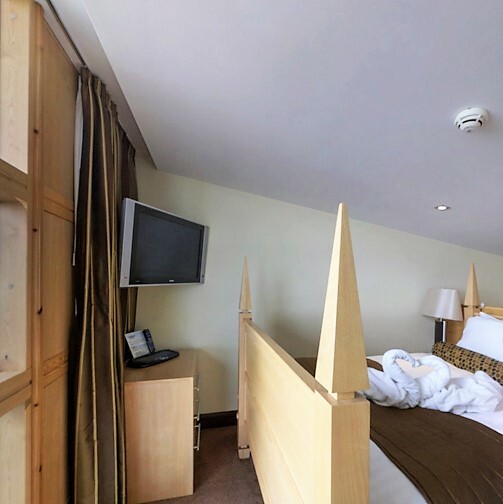 Located in a secluded part of the Hotel, you can relax in the warm, comfortable and light surroundings of our Bridal Suite complete with modern beechwood furniture, rich textured fabrics, fully-carpeted lounge area, blackout curtains and drapes, Velux security double-glazed windows and frame. The Bridal Suite is supplemented with a study chair, lounge chair, double leather sofa bed and fitted with a solid mahogany, noise absorbing security door fitted with electronic privacy system. The south facing room has a balcony with beautiful panoramic views. Lighting in the room is by way of a mixture of high intensity, low energy modern LED main lighting, bedside touch LED reading lights, fluorescent bedside lamps and fluorescent floor standing lamp. The bathroom/shower room is finished to a high standard with glass walls, glazed shower screen partition, Spanish stone floor tiles and a heated towel rail. The Bridal Suite has a uniquely-designed, four-posted king-size bed situated on a mezzanine floor level. 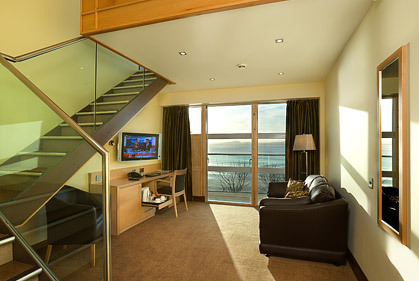 Full-height, Velux double-glazed windows command outstanding views of Pettycur Beach, the Firth of Forth and Edinburgh. The Bridal Suite is equipped with an additional flat-screen television, telephone and air conditioning. The spacious main lounge also has a lounging sofa which can be converted if required for an additional double bed for up to 2 supplementary guests. A must for that wedding, special anniversary or that special celebration! Room size is 35 sq metres with balcony at 4 sq metres and can accommodate to a total of 4 guests with a modern, four-posted king-size bed and a double sofa bed. Please phone to book our Bridal Suite. Click on any of the links above for more details of the rooms.